Sonic.net Selected by Google to Operate Stanford Fiber Network ! Sonic.net today announced it has been selected to operate and support the trial fiber-to-the-home network Google is building at Stanford University. This experimental project will test new fiber construction and operation methods, while delivering full gigabit speeds to approximately 850 faculty and staff owned homes on campus. Sonic.net will manage operation of the network, provide customer service and support and perform on-site installation and repair. Sonic.net is Northern California’s leading independent Internet service provider. 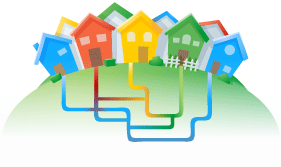 The Stanford trial network is completely separate from the community selection process for Google’s Fiber for Communities project, which is still ongoing. Google’s ultimate goal is to build a fiber-to-the-home network that reaches at least 50,000 and potentially up to 500,000 people, and it plans to announce its selected community or communities by the end of the year. Sonic.net currently operates California’s largest open Internet access network, offering services today primarily via next-generation copper. The Santa Rosa-based company previously announced its own plans to deliver a fiber-to-the-home network in Sebastopol, Calif., and looks forward to working with Google on the innovative gigabit network being planned for the Stanford community. Sonic.net’s open network provides services to seventy other Internet service providers delivering broadband services across a thirteen state territory. Construction of the Stanford fiber network will begin in early 2011. Sonic.net, founded in 1994, provides broadband access to consumers and wholesale partners in a thirteen state region. Sonic.net’s leading product is “Fusion”, which combines unlimited broadband and unlimited local and long distance home telephone service. Sonic.net adopted a European pricing model for “Fusion,” forgoing the common practice of limiting a customer’s Internet speed based on pricing tiers. For $39.95, every Fusion customer gets the maximum Internet speed possible at their location — up to 20Mbps — plus a traditional phone line with unlimited U.S. calling. For more information, visit www.sonic.net.